The Bicentennial Bikeway from the Goodwill Bridge to the area behind 1 William Street will be closed for 12 months to allow upgrade works. From 5am Monday 16 July for a period of 12 months the Bicentennial Bikeway between the Goodwill Bridge and area behind 1 William Street will be temporarily closed. A diversion will be in place along Gardens Point Road and the adjacent footpath with both on and off-road options available for cyclists. A pedestrian pathway is also available. The upgraded section of bikeway is expected to open mid-2019. Access to the QUT CityCat terminal will be maintained at all times. For safety, temporary fencing will restrict access to the existing bikeway while construction activities are undertaken. Construction hours will be 6.30am to 6.30pm Monday to Saturday. Directional signage and maps will be in place to assist with way finding. During this period, Gardens Point Rd will become a shared zone with on-road cyclists. To improve the safety for pedestrians, cyclists and motorists, the speed limit for Gardens Point Road will be reduced from 40km/hr to 20km/hr. All road users are expected to comply with the reduced speed limit. 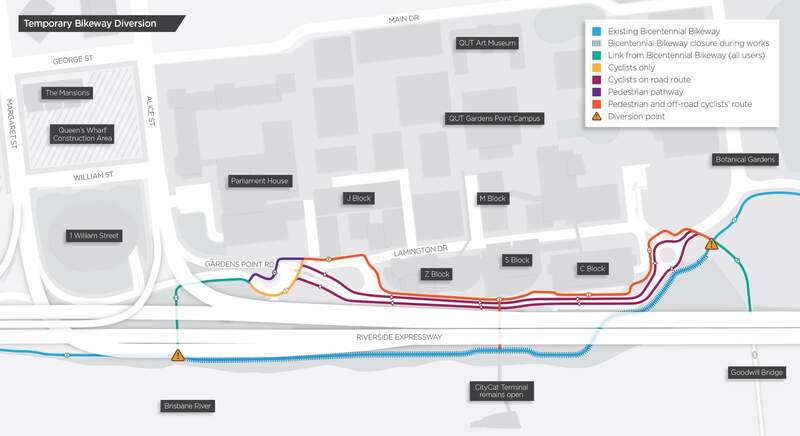 When complete, the upgraded section of bikeway will have been transformed to include a 3-metre-wide separated bikeway, with improved lines of sight and the removal of dangerous pinch points and adjoining 2-metre wide pedestrian path.